Swami home in a right royal fashion. He may not be a Roman hero, returning from the field of battle with the laurels of many victories on his brow. But peace hath her victories no less than war, and, in the bloodless battle that he has fought on behalf of a religion, which teaches the highest doctrines of peace and brotherhood amongst mankind, entitles him to the eternal gratitude of his fellow-believers. He has raised the Hindu nation in the estimation of the Western world, and has created for the Hindu faith an interest, which will last through all time. It is impossible to over-estimate the value of his services in America to the cause of Hinduism. Hundreds of men and women have enlisted themselves under the standard, which he unfolded in America , and some of them have even taken to the bowl and the yellow-robes. The work, that he had to do, speedily assumed such proportions as to necessitate the despatch of fresh re-inforcements from India to keep it live in America . Swami Saradananda is busy in Boston in watering the seeds, which were sown there by Swami Vivekananda. The classes opened in several places in America , and even in England , for the teaching of Hinduism in its purer form, are a sufficient token of the leaning towards Vedantism, which the West has begun to manifest under the inspiring and soul-stirring eloquence of Swami Vivekananda. 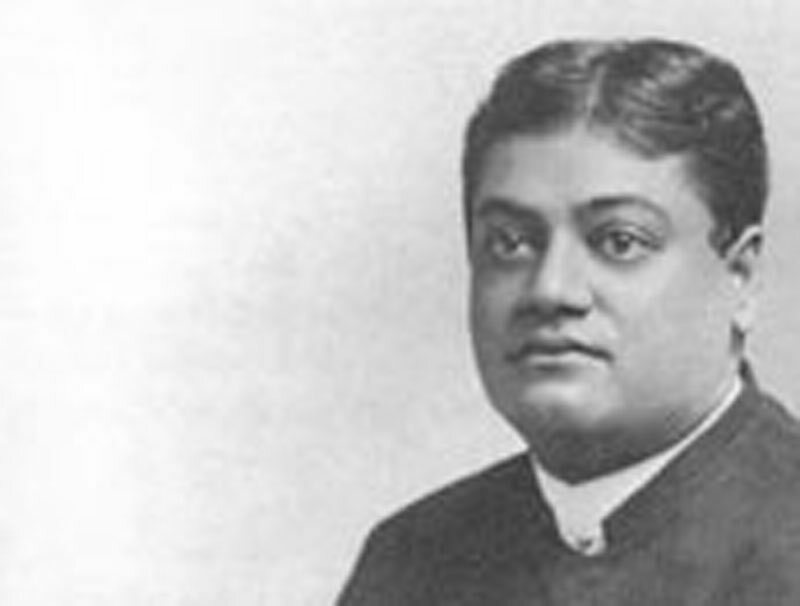 Those that attended the lectures, delivered the other day at the Emerald Theatre by Mr. Turnbull of Chicago, must have been thoroughly im­pressed with the magnitude of the change, which has been wrought by Swami Vivekananda in the hearts and convictions of the American people. The Swami delivered his first memorable address on Hinduism in the Parliament of Religions, which was held in Chicago , in September, 1893. He made a tour of almost all the principal places in the United States , and wherever he went, he won fresh converts to his faith, and left behind him a lasting impression of his visit. The charm­ing presence, the impassioned eloquence, the extraordinary strength of will and tenacity of purpose that he brought to bear upon the work which took him to America , carried con­viction everywhere. It was, indeed, a sight to see this eloquent Sannyasi preaching the religion of his fathers in re­gions, which send missionaries to India to convert the Hindus into the Christian faith. The tide of conversion seemed to have rolled back from the East to the West—the tables were completely turned—and the Hindu mission in the West was crowned with a greater and more glorious success than what has ever been vouchsafed to Christian mission in the East. The Theosophical Society had no doubt cleared the ground, and prepared the soil, but it was reserved for a native of Hindustan to sow in the West the seeds of the religion, bequeathed to him as a priceless legacy by his noble ancestors, whose benefit he wanted the entire world to share. The seeds have not fallen by the way-side, and been devoured by the fowls of the air. They have taken root in the soil, and will, as the years roll on, first put out the blade, and then the ear, and then the full corn in the ear. And all this has been effected within the short space of three years. Where is the Hindu, who can help a feeling of pride at this unique record, and who does not long to clasp Vivekananda in a close and fervid embrace. He deserves well of his brethren in the faith, for he has rendered yeoman's service to the cause, which is so dear and near to their hearts. His services to his country's cause, combined as they are in the sphere of religion, are on a par with the achievements of Rajah Ranjit Singji, Messrs. Chatterji, Bose, and Biswas, in the respective departments of human activity, on which they have shed so brilliant a lustre. We cannot yet understand the far-reaching consequences of the work, which Vivekananda has achieved. The gift of the Seer has not been vouchsafed to us, and the inspiration of prophecy is not one of our acquirements. But if the present be the best prophet of the future, " if coming events cast their shadows before," we may take it upon ourselves to say that Viveka­nanda has forged the chain, which is to bind the East and the West together, the golden chain of a common sym­pathy, of a common humanity, and a common and universal religion. Vedantism, as preached and inculcated by the Swami, is the bridge of love, which is to extend from the East right away to the West, and make the two nations one in heart, one in spirit and one in faith—a consummation so devoutly to be wished. Can humanity, then, be ever too thankful to Vivekananda ? Can his fellow-countrymen be ever too proud of him or be ever too grateful to him ? He is a Calcutta Bengali, and let all Bengalis of Calcutta greet him with the homage of their hearts. It will be a foul shame if we fail in the performance of a duty, which is so incumbent upon us. Let us follow in the wake of Madras , which, be it said, to her eternal honor, has set us a glorious example in this matter. Let us show that so far as his own countrymen are concerned, Vivekananda has not been " ploughing the sands on the sea­shore." A preliminary Committee should at once be formed and ways and means devised to present the Swami with an address of welcome, setting forth fully our high appreciation of his invaluable services to our cause. All right-thinking men of the community ought to assist in the furtherance of so noble and patriotic an object. No pains or expenses should be spared to make the reception worthy of the Metropolis, worthy of the Swami, to whom it is to be accorded and worthy of the culture and patriotism on which Bengal so greatly plumes herself. Today this editorial may seem to some as prophetic... but it was used shortly after its publication by the Christian Literature Society for India to elicit letters from a number of prominent" Americans. They then published these letters in their book--Swami Vivekananda and HisGuru with letters from prominent Americans on the alleged progress of Vedantism in the United States.